Happy Tuesday, bloggy friends! It's that time of the week! The second Tuesday of the month means we're chatting about trending topics. 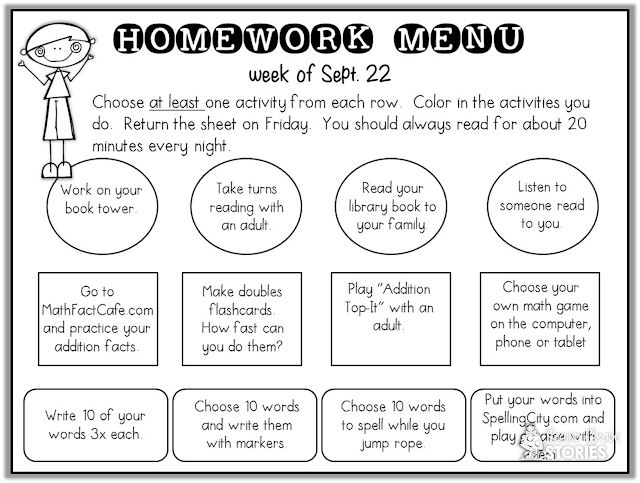 This month we'll share what we do for homework. Blah. Homework. I admit. I do not like homework in second grade. AT. ALL. Now don't get me wrong - I am the first person to say that students need to learn to be responsible, and that they need to practice what they have learned. I just don't think they're ready to be doing that with homework yet, especially in the lower grades. Last year, my team and I thought long and hard about homework. And we thought about what it was we wanted to accomplish. Good in theory, but these are 7-year olds. They are not the ones remembering to set a time to do their homework, or put it in their book bag, or bring it to school. Can they do those things? Yes, somewhat. But for the most part, the responsibility lays squarely on parents and caregivers. For some families, this is not an issue. For others, the business (and necessities) of life make adding another responsibility just too difficult. I always tried to send home things I KNEW we had done a million times in school so students could work independently. I couldn't send anything challenging, or sometimes even mirroring what we were working on in class, because families had no idea HOW we were doing it. It became confusing for the adults, stressful for everyone and just not worth it. I also do - as I am sure you do - lots of differentiating in my classroom. So one activity would have different expectations, different levels of support, etc. when we worked on things at school. I couldn't do this with homework without driving myself batty. I have been hearing a lot lately from parents about how stressful doing homework with a second graders can be. Finding the time, getting them to be focused, making sure it is done correctly and neat... and by the time it gets to school I have no idea if the work is a reflection of what the student can do independently, or if they had help (lots of it!) from family members. And some kiddos, truth be told, just never brought it in at all. As much as I would have liked to just assign nightly reading (with NO log! - that's another post! ), that just wasn't an option for us. 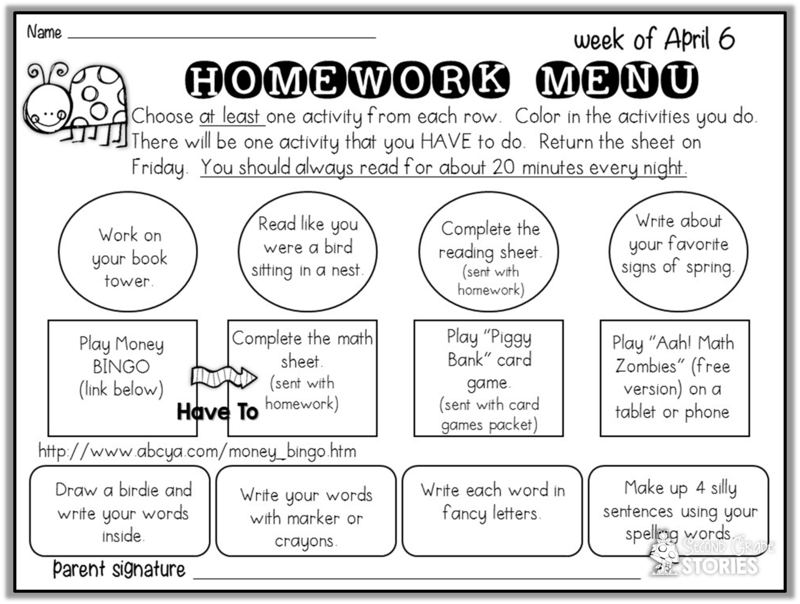 We decided to create a homework menu, with a variety of choices for students in the areas we wanted a little practice - reading, spelling and math. Here's an example of what my menu looks like. Let me start by saying that students are responsible for reading - with or without support - every night for at least 20 minutes. Bedtime reading counts, reading in the car, etc. We also did a book tower project that helped students get the reading done. I'm going to save the reading log/tower part to talk about next month. Students need to choose at least ONE activity from every row/shape. The activities in each row work on one subject, but in a variety of ways. I included regular pencil and paper activities, movement, technology, and more. This gave families lots of choice - and they really appreciated that! They could tailor the choices to what their child needed, liked or even just what they had time for! 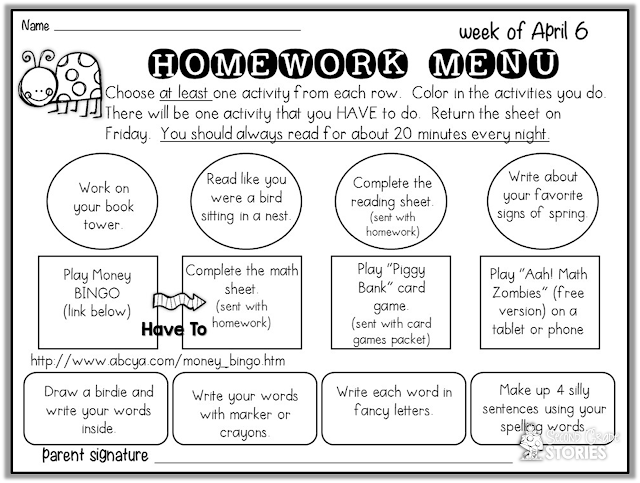 We had lots of positive feedback on using the menu, and parents who preferred the "traditional" paper homework activities still had those. Later in the year, as my kiddos were becoming more independent and responsible in class, I added a "have to" each week. This rotated between a reading and a math activity that was turned in when homework was due. It got students ready for the idea of nightly homework in third grade and the increased expectation helped build responsibility. The other major change we made was to have homework go home on Monday and come back the following Monday, rather than on Friday. Honestly, families have so much going on that sometimes they need the weekend to catch up. 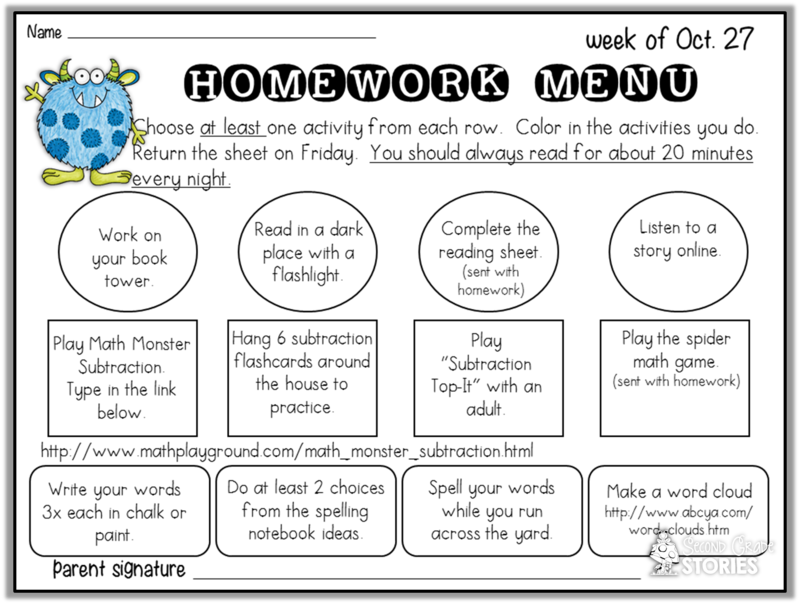 Many of my kiddos did turn the homework menu in on Fridays. Some really appreciated the extra time - and I got homework turned in more consistently from everyone this way. What happens if homework is not turned in? The first time I let it slide - everyone gets a freebie :-) The second time I talked with the student about being responsible and why it wasn't turned in. If the reason was, "My Mom forgot to put it in my backpack." We talked about how remembering to bring it to school is YOUR responsibility and came up with some strategies to help everyone remember. For my chronic no homework kids, it helped to call or send a note home asking how I could help. 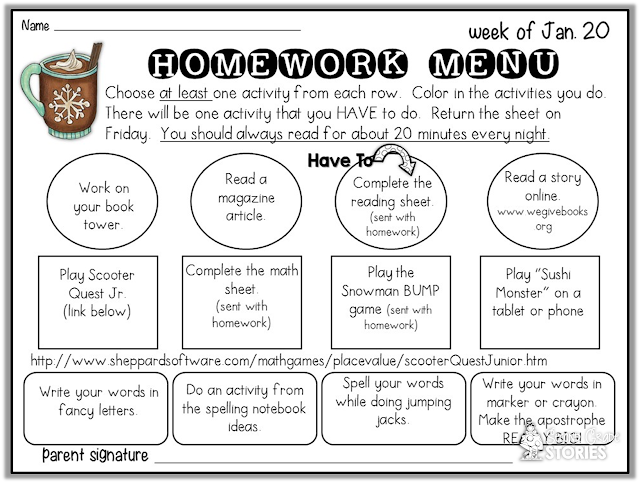 This year I'm going with the same homework menu ideas as last year - and I'm adding one other twist! Each month I'm going to send home a project for students to do - completely optional, INSTEAD of the regular weekly homework. (Reading each night still stays the same.) For example, September's project will be an "All About Me" project. 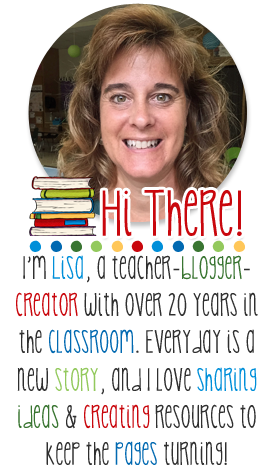 Students will need to create some sort of way to share important information about themselves. They need to read 2-3 titles of books (suggested list sent home) and share how they are the same and different as one of the characters. They need to write about themselves, and then create a display, powerpoint, whatever way they choose! - to share with the class. Each month's project will have a different focus (families, giving/kindness, cooking, etc.) I'm still working on finishing September's project, but I'll share my ideas when it's completed. Now that you've seen how I do my homework, I want to hear from you! 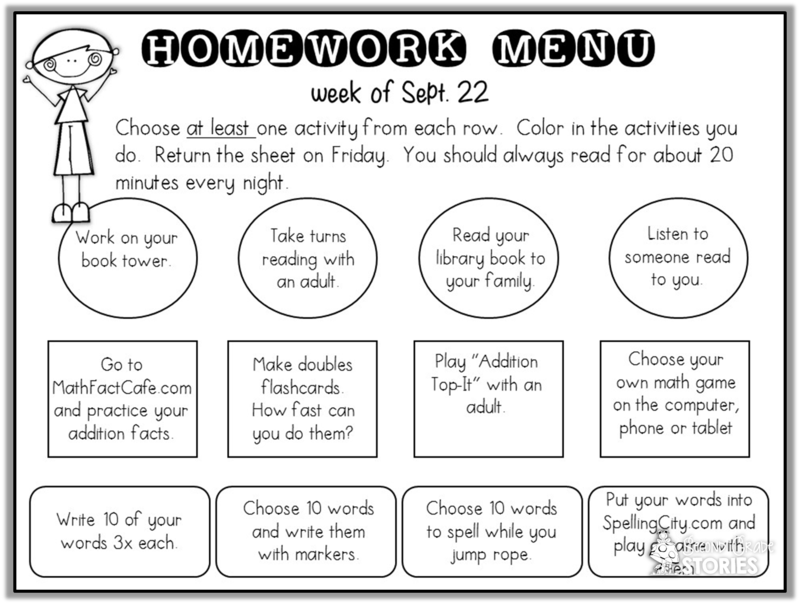 How do you do homework with your kiddos? What works for you? Leave me a comment or email me so we can chat. I'm always looking for new ideas! I love this idea! I am going to incorporate menus for the coming up year as well. Do you happen to have these listed in your teachers pay teachers shop? I would love to hear more about the month long project. Have you written about that yet? I agree. I would love these. I would purchase them on TPT. © 2015 Second Grade Stories Natasha Template designed by Georgia Lou Studios Template customized by A Bird in Hand Designs Clipart by Sarah Pecorino Illustrations All rights reserved.